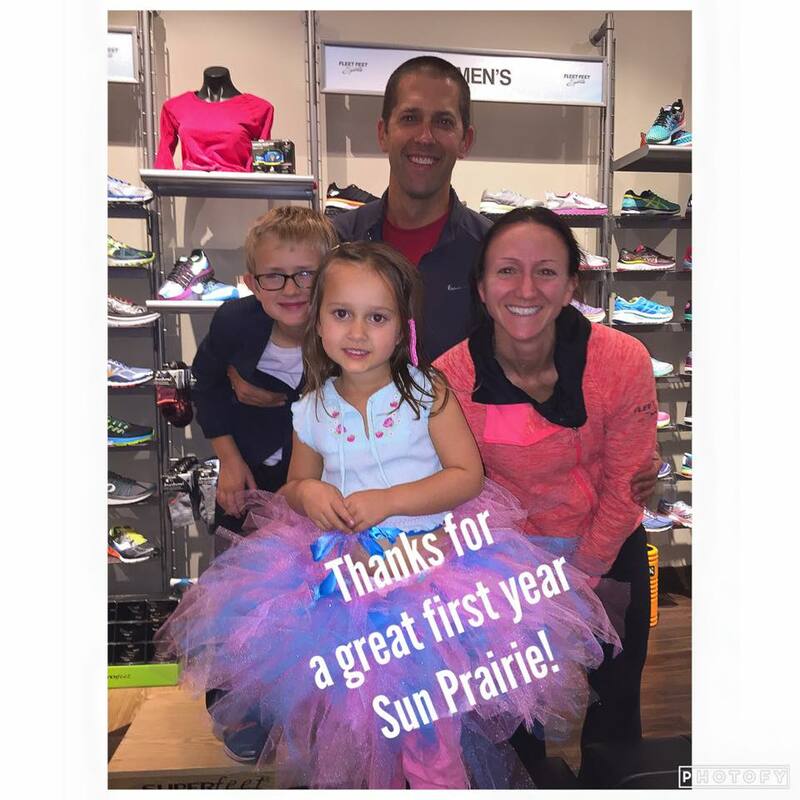 Another year has passed and we wanted to take a moment to reflect on some of the happenings at Fleet Feet Sports Madison & Sun Prairie in 2015! January: We rang in the New Year with our Annual Fleet Feet New Year’s Day Dash at Quaker Steak & Lube in Middleton. A good time was had by all! We kicked off our Winter Warriors Training Program, with many hearty running souls keeping their fitness levels up during the dead of winter. February: Our Destination Training group that had trained over winter packed their bags and headed to Huntington Beach, California to compete and take in some warm weather. We heard no one misbehaved on this trip! 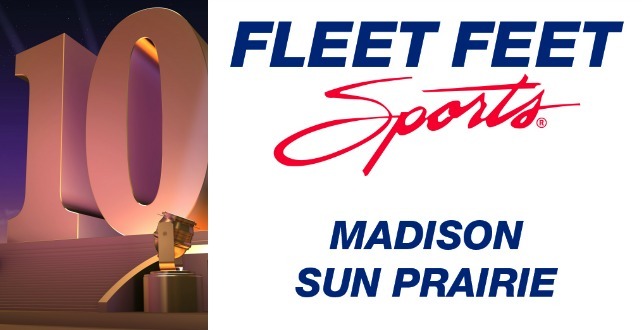 In addition, Fleet Feet Sports Madison & Sun Prairie won the BEST of MADISON award for Sports & Recreation Shop. Thanks to all that voted and supported us for this recognition! March: The Madison Shamrock Shuffle was a great event we are always proud to sponsor. This annual event raises needed funds for the Boys & Girls Club of Dane County. We also kicked off another successful season of Force of Orange, SPEEDPlay and No Boundaries! April: Fleet Feet Sports Madison Celebrated its ten year anniversary with a celebration at the store. Thanks to all our customers and friends for the support over the years! May: Many spring events began in May. We were pleased to sponsor the Annual Lake Monona 20K & 5K and the Madison Marathon Spring Events. Special thanks to those who volunteered; without you these events could not happen! June: We love the Pheasant Branch Trail System and were proud to be a main sponsor for the first Prairie Chase event. Funds were raised for this awesome place to run and hike in Middleton! July: Our new website went live! We are now able to offer online shopping for many of the great products we carry in our stores, available 24/7! We kicked off our Power of Running Campaign along with over 100 other Fleet Feet stores. It was a way to give back to our selected charity of Henry Vilas Zoo. This campaign also included Brooks Power Hour Pub Runs and a fun Recess Run held at the zoo. Our first Adventure Training Circuit workout with Woodall Training was held at Indian Lake Park. A great workout and fun time was had by all participants. August: Our team completed an Interactive Staff Meeting up at the Capitol Square. We know we are more creative when we workout together. Another great Madison Mini Marathon & 5K was held in Madison. It was a beautiful day to run and celebrate at the Memorial Union Terrace on the lake! September: We are always inspired by the competitors at IRONMAN Wisconsin. So much fun to watch and cheer on our friends and customers on their special day. Congrats to all! We held our second Adventure Circuit Training with Woodall Training at Indian Lake Park. It was a warm morning and so nice to be out in nature running and doing some cross training! October: Thanks to all our friends and customers that helped us celebrate Fleet Feet Sun Prairie’s one year anniversary. It was a great night with a fun run and some good beer and snacks after! We had a great turnout for our combined Halloween Pub Run from Paul’s Bar in Middleton. Great run, awesome costumes and prizes courtesy of Brooks Running. November: Matt & Jessica competed in the New York Marathon and had an amazing trip. Our Annual Fitnatic Weekend took place (during Black Friday Weekend) to get shoppers in the mood for the upcoming holidays. We also want to thank customers for supporting us on Small Business Saturday. We love serving our customers and giving back to our local community. We had two Fleet Feet teams as well as our No Boundaries participants representing at the Berbee Derby on Thanksgiving morning. Our Destination Training Group began training for the Gasparilla Classic held in Tampa, Florida in February 2016. December: Jessica and Megan attended The Running Event in Austin, Texas and got to meet running superstar Meb Keflezighi. We also had a blast at our Holiday Lights Ugly Sweater Pub Run from the Coliseum Bar. Thanks to all that contributed to our Allied Running Club and to Brooks Running for the holiday shirts and socks. Thank you for being a part of our 2015. We look forward to being a part of your journey again in 2016!